Muddle berries in to the fresh squeezed lemon juice, honey and rum (we cheated and put it all in the blender..but both works). Strain in to a punch bowl making sure there are no bits. 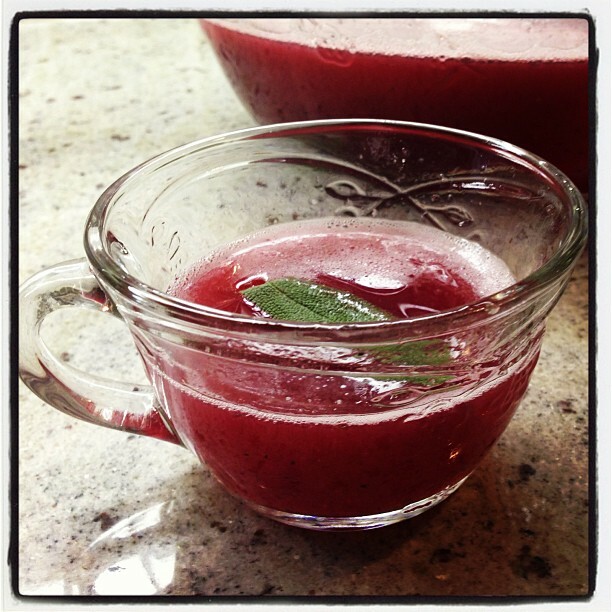 Serve in a Punch Bowl with large Ice Cube, sprinkle in the Sage leaves and stir before serving. Yesterday was Crystal Bryson‘s Birthday (my boyfriends mum) and in honor of the occasion, as well as Super Bowl Sunday, Greg Bryson created this delicious punch. It was a beautiful mix of flavors with the sage, honey and lemon. The blueberries gave it a gorgeous pink color too. The punch itself is sweet from the moscato and honey, herbaceous from the sage and strong too. I love Rum punches so I was a definite fan and everyone else seemed to love it also. This was easy to make and great for large parties. Serves about 8 people, possibly more.